Did I just never notice the Facebook like button in the forum threads before? Possible, I never pay any attention to Facebook. Kinda counter-intuitive for a privacy-based org, no? (in my case, the privacy badger extension replaces it, I don't have facebook, but they are still trying to build profiles on everyone and our content). I don’t see any such button? Could you please take a screenshot of what you’re refferring to? Do you see it on different devices? Fyi. Always browse from chrome and thats where the extension is. Found it, and from the incognito mode, there does appear to be something facebooky in the code. fb:app_id in the meta tags. Going through all the code, the only references to Facebook I can find are in the content of the thread title and comments. But it may be that the forum software supports a Facebook like option that we've had disabled for years and forgotten about long ago. I'll ask around, if anyone still knows. @MrC: Hmm. That's really odd. I guess I can try to setup a VM later an install a bunch of stuff to try to get it to appear...but it would be helpful to know what I should be installing. Just AdBlock+ and Privacy Badger in Chrome? Really odd, if those are causing Facebook buttons to spontaneously appear for some people. We made some adjustments on our end. Are you still seeing this? lol... I took a closer look when I got in as well. 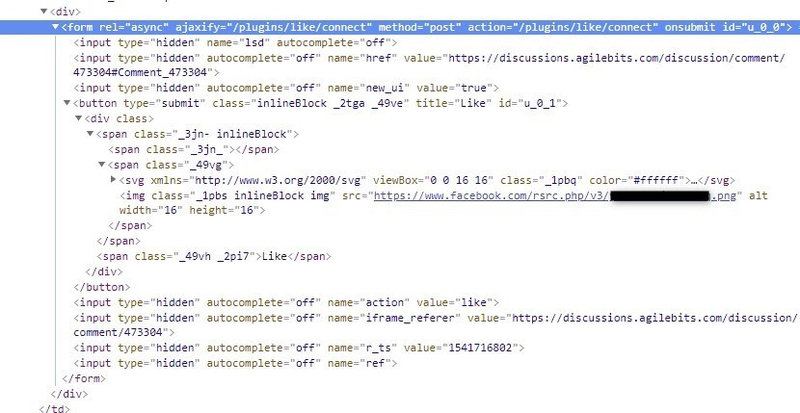 2) But (and maybe it is or isn't pertinent) I AM seeing fb app id (for the developer) and the open graph tags still. 3) there are some references to it in the JS, (like in vendors.min.js) but nothing I saw immediately in network calls. So dunno. Really, when it comes to FB... I just think they are the guys spying on me through my cable box (jking). What I mean to say, I just assume they are much smarter or more clever or shrewd than I am. On the other hand, if you look at the forum landing page and view source, you see that Marco%20Van%20de%20Water is using his FB profile for the forum I guess. Thanks for the updates, and for bringing this to our attention. I’m still a little perplexed as to why I never saw it myself. I suspect it was a recent addition to the forum software, or perhaps a recent change to those extensions resulted in Zombie Facebook button rising up. I guess Halloween was not long ago... Hopefully it will default to treat over trick in the future. Sorry for the scare, folks!